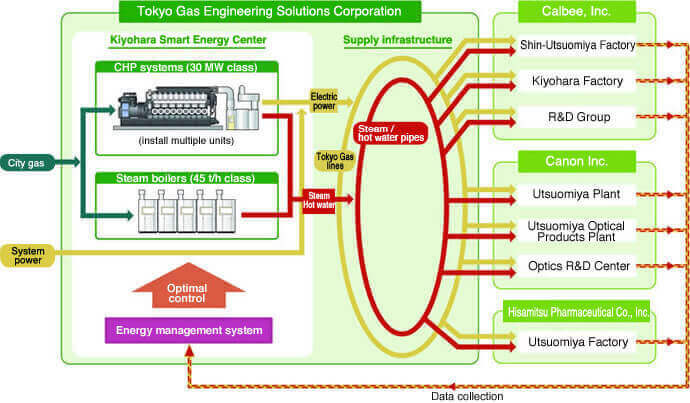 The Tokyo Gas Group focuses on smart energy networks (SENs) that capitalize on the advantages of combined heat and power (CHP) systems* to optimize local generation and consumption of energy by linking heat, electricity and information networks toward making communities more energy efficient, environmentally friendly and resilient to disasters. 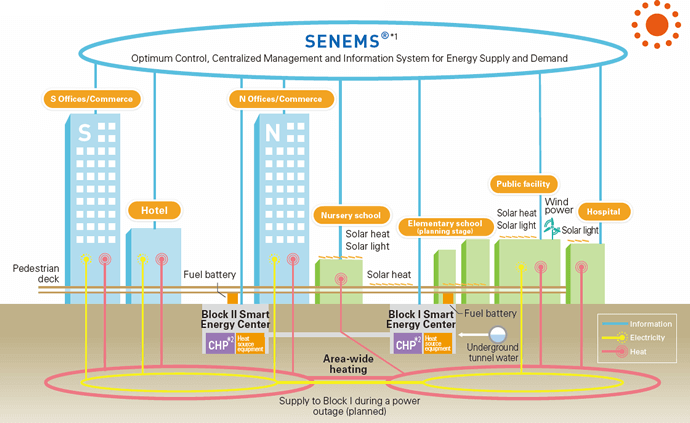 With CHP systems at the core, SENs raise energy efficiency by making maximum use of renewable and underused energy sources, which are integrated with information and communications technology (ICT) to construct an optimal energy system for accurately managing supply and demand. This also improves disaster resilience and so meets BCP (business continuity planning) needs while enhancing the value that cities offer. SENs are now being developed in redevelopment zones and other areas in the Greater Tokyo Area. One is the Tamachi SEN, which was awarded the Minister of Economy, Trade and Industry Award for joint projects in the Successful Case of Energy Conservation category at the Energy Conservation Grand Prize Awards in fiscal 2016. *CHP systems generate electricity and recover waste heat generated as a by-product. The Tokyo Gas Group has been collaborating with Minato Ward in Tokyo to develop a low-carbon, disaster-resilient community in the northern district adjacent to the east exit of Tamachi Station. The project is intended to optimize energy demand, save energy and enhance disaster resilience by building a SEN. In 2014, construction of the Block I Smart Energy Center was completed and began supplying heat and electricity to the Minato Park Shibaura, a public facility, a hospital and child welfare facility in the Life Zone. Then, in May 2018, the Block II Smart Energy Center began operations within the New Urban Zone and started supplying energy to office buildings and a hotel. This public-private project is also intended to optimize energy management across the entire area by having the two SENs supply heat to each other, thereby reducing CO2 emissions by 30% below 2005 levels. The Tokyo Gas Group is pursuing urban development with the potential to extend deep into the 22nd century in a redevelopment area located around land the Group holds in the Toyosu wharf district of Tokyo’s Koto Ward. 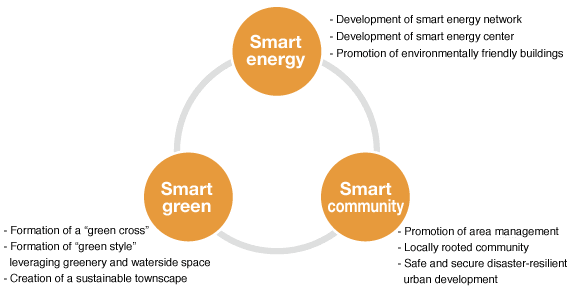 Under this project, “Tokyo Smart City TOYOSU 22,” we are undertaking futuristic urban development guided by the three concepts—“smart energy,” “smart green,” and “smart community,”—from a long-term perspective looking beyond the Tokyo 2020 Olympics and Paralympics, as a high-quality development to raise the value and appeal of the area. 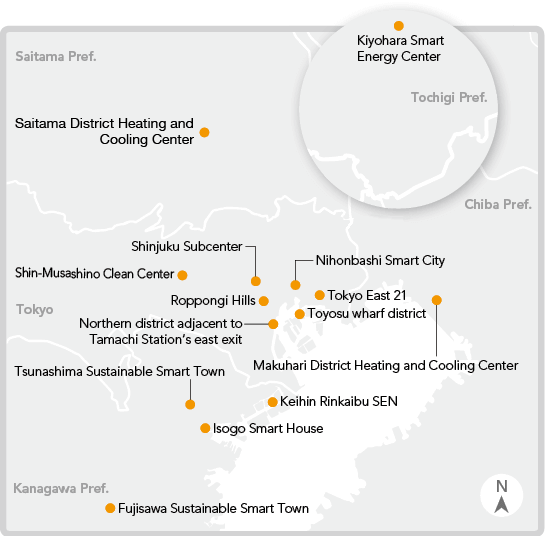 In May 2016, we completed construction of a smart energy center in Zone 4 (see figure below), owned by Tokyo Gas Site Development Co., Ltd., in preparation for development of a SEN in the Toyosu wharf district. This is the second SEN to be developed by Tokyo Gas in an urban redevelopment district, the first being in the northern district adjacent to Tamachi Station’s east exit. The newly completed smart energy center will be equipped with one of the world’s most efficient CHP systems, which will supply electric power to the Toyosu wholesale market while waste heat is used to power equipment at the center. Environmental friendliness will be enhanced by adopting gas pressure differential power generation*1 using gas supply pressure. By applying CHP systems with blackout start specifications*2 to construct the systems, laying independent power lines*3 and employing disaster-resistant medium-pressure gas pipelines, we will create a system capable of an uninterrupted supply of heat and electricity, even during power outages or other emergencies, thus enhancing the district’s resilience to disaster. The network will also have a “SENEMS”*4 for centrally managing and controlling energy throughout the district using ICT. SENEMS will instantly analyze and process real-time information on supply and demand, weather conditions and specific characteristics associated with each day of the week in order to automatically optimize energy demand and supply for the area. We plan to progressively expand the heat and power network as development of Zones 4 and 2 progresses. *1 Power generation based on the use of gas supply pressure. *2 Process of independently restarting the generator during a power outage. *3 Power lines laid independently by an operator. They can be used at a customer's discretion when grid power has been interrupted. *4 Smart Energy Network Energy Management System. In October 2016, Tokyo Gas and Tokyo Gas Engineering Solutions began constructing the Kiyohara Smart Energy Center. This is based on a 30 MW-class cogeneration system that will supply electricity and heat in the form of steam and hot water to seven plants operated by three companies in the Kiyohara Industrial Complex on the outskirts of Utsunomiya City in Tochigi Prefecture. The project will supply a combination of electricity and heat to multiple plants in different industries as Japan’s first integrated energy-saving project serving multiple plants*1 in an inland industrial park. Also, the project will incorporate an energy management system*2 to concentrate data on electricity and heat (steam and hot water) usage for multiple plants in different industries with distinct demand depending on the time and season. By efficiently meeting those needs, we expect a reduction of approximately 20% in energy consumption*3 and CO2 emissions,*4 respectively. In addition to the effects of reducing environmental impact, blackout start specifications*5 will be adopted to supply electricity and heat (steam and hot water) to each plant in the event of a prolonged power outage or a disaster, thereby enhancing security. The center’s construction is compatible with Tochigi Prefecture’s energy strategy and Utsunomiya City’s action plan on addressing climate change, formulated by referencing the government’s reduction targets for greenhouse gas emissions and other goals. It is therefore expected to serve as a model for other regions in Japan. In fiscal 2016, the project was selected to receive a subsidy from the Ministry of Economy, Trade and Industry for supporting energy conservation at plants and other worksites. *1 Project for saving energy by integrating production lines and sharing utilities between multiple plants to facilitate the mutual use of energy and products. *2 System for realizing optimal operation and control of CHP systems by visualizing the energy use of each company and predicting electricity and thermal load trends. *3 Rate of reduction compared to the combined electricity and gas usage data in fiscal 2015 for seven plants operated by Calbee, Inc., Canon Inc. and Hisamitsu Pharmaceutical Co., Inc.
*4 Rate of reduction compared to the combined CO2 emissions data in fiscal 2015 for seven plants operated by Calbee, Inc., Canon Inc. and Hisamitsu Pharmaceutical Co., Inc.
*5 Process of independently restarting the generator during a power outage. Capable of an uninterrupted supply of heat and electricity even during a power outage or another emergency by laying independent power lines and employing disaster-resistant medium-pressure gas pipelines. 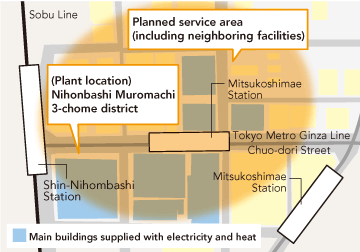 A large high-efficiency CHP system has been installed in the redevelopment zone in Nihonbashi Muromachi 3-chome to serve as an independent distributed power source. The system will supply electricity and heat to office buildings and commercial facilities in the surrounding area as well as within the redevelopment zone, making it the first such project in Japan. New projects of this kind will encourage the area-wide adoption of smart energy technologies and contribute to the development of cities that are much more resilient to disasters. The project is being run by Mitsui Fudosan TG Smart Energy, Inc. (a joint venture formed by Mitsui Fudosan and Tokyo Gas) and is expected to be completed in March 2019. 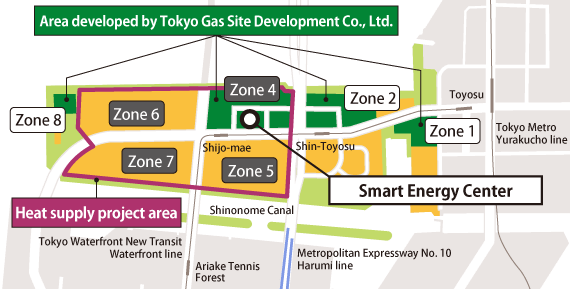 The Tokyo Gas Group is pursuing a number of projects, including development of an energy center, in Tsunashima Sustainable Smart Town, a next-generation urban smart city that will be developed on the former site of a Panasonic factory in the Tsunashima-Higashi district of Kohoku Ward in Yokohama, Kanagawa Prefecture. The first energy services came on stream in December 2016, and they are now being gradually expanded. The plan is to develop energy supply systems based on an advanced model for sharing heat and power supplies to diverse facilities over a more compact area than in the past. We will improve supply continuity by installing a CHP system in the town energy center and using multiple power sources and disaster-resistant medium-pressure gas lines. The use of more efficient equipment and area-wide energy utilization will also improve environmental friendliness. The delivery of energy services will ensure the financial viability of these improvements in supply stability and environmental friendliness.